5.0 x 3.5 x 3.5 in. US customers finally got their hands on the company's first CMOS sensor-based PowerShot digital camera when the Canon PowerShot SX1 IS shipped in April 2009. Announced in Europe over a year ago, the Canon SX1 IS is closely related to the CCD sensor-based SX10 IS, which in turn replaced the company's previous PowerShot S5 IS model. Sensor resolution and size, as well as the lens / power / storage / etc. are unchanged. The Canon SX1's zoom lens has a lot of reach, offering everything from a useful 28mm wide-angle to a powerful 560mm telephoto. Thankfully, the Canon SX1 IS includes true optical image stabilization, a must-have for a camera with a lens this powerful. Maximum aperture is f/2.8 to f/5.7 across the zoom range. The Canon PowerShot SX1 stores its images and movies on Secure Digital cards including the newer SDHC types, and offers both NTSC / PAL video and USB 2.0 High Speed computer connectivity. Power comes from four AA batteries. The big story of the Canon SX1 is its movie capability - significantly improved over the SX10 thanks to the higher-speed CMOS sensor. The SX10 is limited to VGA (640 x 480) movies at 30 frames per second, but the SX1 can capture 1080p (1,920 x 1080 pixel) movies at the same framerate. To take advantage of the higher-quality movie mode, the Canon SX1 also adds HDMI high-definition connectivity, upgrades the LCD from a 2.5" 4:3 aspect ratio type to a 2.8" 16:9 wide-aspect display, and uses a 16:9 aspect ratio electronic viewfinder instead of a 4:3 aspect EVF. The speed boost isn't limited solely to movies, of course. The Canon SX1 is able to capture full-res images at four frames per second - a significant step up from the 1.4 fps offered by the SX10. As well as AF tracking, the Canon SX1 IS's autofocus system has improved face detection capability. Canon says the camera will recognize faces at most angles, and has included a Face Detection self timer which automatically takes a photo two seconds after an additional face enters the scene. The standard ISO sensitivity range offered by the Canon SX1 ranges from a minimum of ISO 80 through to a maximum of ISO 1,600. Available PowerShot SX1 IS shutter speeds range from 1/3,200 to 15 seconds. Metering modes are evaluative, center-weighted, and spot. Exposure modes include program, aperture- or shutter-priority, or a fully manual mode. Flash range when set to Auto ISO is rated at 1 - 17' (30 cm - 5.2 m) at wide angle, and 3.0 - 13.1' (0.9 - 4.0 m) at telephoto. The Canon SX1's hot shoe allows connection of most modern Canon flashes for much greater range. There are seventeen scene modes, and the SX1 also offers a new Intelligent Contrast Correction function. The Canon PowerShot SX1 IS began shipping in the USA from April 2009, priced at US$600. Don't beat yourself up if you confuse the Canon PowerShot SX1 IS with the SX10 IS. These 20x zoom digicams are physically quite similar. A little chrome here, a wider LCD there and that's about it. They share Canon's attention to fit and finish with a build quality unusual in this category. But inside, the Canon SX1 is quite a different beast. The 10-megapixel sensor in the Canon SX1 is not the usual CCD found in every PowerShot ever built but a CMOS sensor. That's a first. By no coincidence, the Canon SX1 (unlike the SX10) shoots Raw and captures HD video. That's exciting, no question. But my first impression of the Canon SX1 was something other than excitement. The word that kept popping into mind to describe the Canon SX1 was "awkward." But after spending some time with the Canon SX1, well, have you heard the one about the ugly duckling? Look and Feel. The Canon SX1 is no larger than its 20x zoom competitors. I have a small tent city of bags here but none of them really fit the bill. If I'd kept the Canon SX1 around much longer, I would have used an UPstrap on it to be able to hang it over my shoulder instead of from my neck. It's light enough either way, though. While it resembles an SLR, the Canon SX1 is significantly smaller than even the Rebel. And it's much bulkier than the brick-sized G10. Its grip, however, is about the same size as the Rebel's. It's a large, comfortable grip, which houses the four AA batteries that power the Canon SX1. There are a few thumb bumps on the back to help you hold the camera. The metal tripod mount is a bit too close to the battery compartment to switch AAs when tripod-mounted, but the card compartment is in a separate bay on the grip side, so no worries there. Above that port is the USB and mini HDMI port. Next to that is the DC In and AV port. But frankly, none of the super long zooms I've tried really seem to have worked out the camera design as well as the Olympus SP550 UZ or Fujifilm S2000HD. Since then the trend has been to use cheaper materials to compensate for the more elaborate, expensive optics. 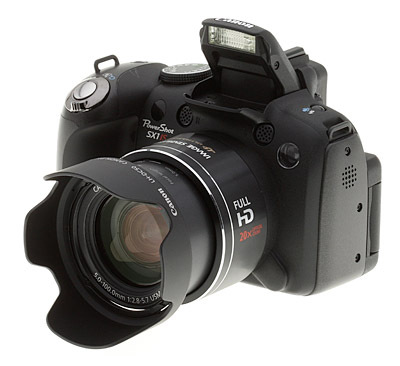 Canon does buck that trend with a good build in the SX1 IS, but the design itself just seems awkward to me. Controls. Controls are what make a dSLR easier to use than the less expensive digicam. There are usually fewer controls on a digicam and they tend to be primarily electronic. The Canon SX1 has more buttons and dials than the average digicam, but you'll still be visiting the menu system more often. There is a dioptric adjustment next to the Canon SX1's electronic viewfinder, which is covered in a rubberized frame so you won't scratch your glasses, something missing on other recent long zoom digicams we've reviewed. The EVF is low resolution, however, taking some of the fun out of using it. The Power switch behind the Canon SX1's Shutter button could not be placed in a more awkward position. You can't reach it with your forefinger while holding the Canon SX1, and if you try to reach it with your thumb you'll drop the camera. So it takes two hands to turn the camera on or off. Nothing new about that, of course, but Power buttons shouldn't be afterthoughts. The Mode dial has the familiar Canon groups of Creative Zone (for Programmed Auto, Shutter Priority, Aperture Priority, Manual, and Custom modes), Auto and Image Zone (for Portrait, Landscape, Night Landscape, Sports, Special Scene modes, Stitch Assist, and Movie modes). The Playback button powers the camera both on and off, my preferred behavior. Some cameras don't let it power the camera on, and some only let it power it on (requiring the use of the Power button to power the camera off). This is simpler, and simpler is better. 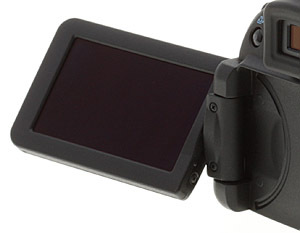 The LCD is articulated, hinged on the left side, rotating to face downward or upward or forward (from which it can be rotated back against the back of the camera). Because it's a 16:9 aspect ratio, it really swings out wide and can get tangled in the shoulder strap. So, frankly, as much as I like articulated screens (for composing high and low shots without cracking my knees), I left it in the routine back panel position. One of the brighter ideas in button technology (if there is such a thing) was the introduction of the Movie button. And the Canon SX1 has it. No matter what mode the Mode dial has selected, pressing the Movie button will start recording video. Pressing it again stops the capture. Simple. And better. Canon is forever changing the functions of the most familiar buttons and the Canon SX1 indulges in that shell game, too. The Control dial's Up arrow switches to Manual focus (not a bad idea, really, on a long zoom where you want a convenient way to set the lens quickly on infinity). The Right arrow displays the ISO settings, Down handles release modes (like the Self-Timer) and Left sets Landscape, Macro, or Super Macro. 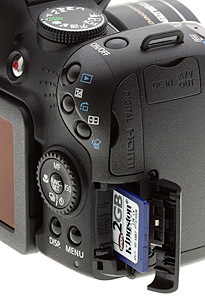 A Display button below the Canon SX1's navigator disk changes what's displayed on the LCD before switching to the EVF and changing what's displayed there. Two functions in one button. It works, but I'm so used to using a button by the EVF to activate it that it takes some getting used to. 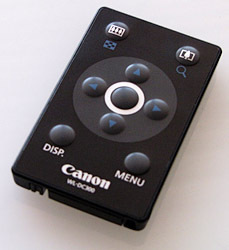 The button by the EVF switches aspect ratios from 4:3 to 16:9. That's a great idea, too, because these are essentially compositional choices and you might want to try the alternative while you're framing the subject. If you're shooting in portrait orientation, a button is a very nice way to do that, rather than returning to the menu system. To that button's left is the Print/Share button whose major advantage is in the seven shooting functions you can assign to it. As the Shortcut button, you can set it to Light Metering, White Balance, Custom White Balance, Red-Eye Correction, Digital Teleconverter, i-Contrast, AE Lock, AF Lock, or Display Off. On the top deck, the Flash button that only does something when you lift the built-in flash up, also lets you record an audio note with an image in Playback or just unaccompanied audio. Audio recording enjoys a few settings on the Canon SX1 that I don't usually see: microphone level and wind filter. The famous Canon Menu button is right where you'd expect to find it under the Control dial. It brings up the LCD menu system's main settings, primarily for basic camera behavior. Shot-to-shot settings are available from the Function/Set button in the middle of the Control dial, just as they are on any PowerShot. 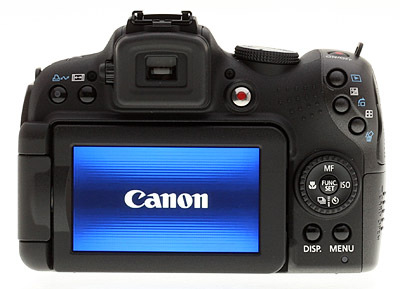 Canon has put three buttons along the top right corner of the Canon SX1 for access with your thumb. They are Playback, EV compensation, and Autofocus control. The EV button is how you switch between aperture and shutter speed in Manual mode, too, using the navigator's wheel to change the selected setting. In Playback, the middle button rotates the image and the bottom button erases it. One of the more useful controls isn't even on the Canon SX1. It's the included remote control, powered by a CR2025 coin battery with a membrane keyboard. You can use it in either Record or Playback mode after activating it using the Release Mode button (Down arrow). When activating it, you can also press the Menu button to set the shutter delay (0, 2, or 10 seconds). It works whether you are behind or in front of the camera, too. In Record mode, you can zoom in or out and fire the Shutter with the remote. You can also change the Display mode, switching to the EVF to turn off the LCD, as well as changing the information displayed. In Playback mode, you can see an index of images, display an image, and enlarge it in steps, or call up the Menu to run a slide show. The remote is a wonderful addition to the package, opening up a few more shooting possibilities, particularly in the wild, and making it a lot more comfortable to run a slide show on your television with the camera cabled to it. Lens. The 28-560mm 20x optical zoom lens is a real treat. And because you can compose easily with either 4:3 or 16:9 aspect ratios by simply pressing that obscure button next to the EVF, it's even more fun. Apertures range from f/2.8 to f/8.0 at wide-angle to f/5.7 to f/8.0 at telephoto. Not the range you have on a dSLR, of course, but a bit more than the two apertures most digicams with Manual mode offer. UD (Ultra-low Dispersion) glass in the lens helps suppress chromatic aberration, while enhanced negative refractive power corrects distortion at wide-angle, according to Canon. Further aberration is controlled with the inclusion of a double-sided aspherical glass-molded lens and ultra-high refraction index lens. 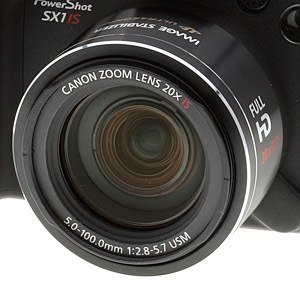 The barrel of the Canon SX1's zoom lens is marked with a focal length scale that reports both the actual focal length and the 35mm equivalent focal length. That's a very nice touch on a 20x zoom. And the Canon SX1's lens enjoys Canon's lens-based optical image stabilization for steady shots at long focal lengths or slow shutter speeds. Optical performance reflected the 20x zoom range. With the 4x digital zoom, you can reach 80 times the wide-angle focal length with this lens. Digital zoom performance was about average. There was 0.9 percent barrel distortion at wide-angle, which is higher than average, but less than 0.1 percent pincushion at telephoto, which is extremely low. Chromatic aberration was high at wide-angle and telephoto, although we detected a color shift from purple-green to blue-yellow moving to telephoto. Blurring in the corners was minor at wide-angle but stronger at telephoto. Zoom performance hasn't improved from the SX10, unfortunately. It's still stepped way too slow or way too fast, depending on how far you move the Zoom lever. So it was awkward trying to compose the image. The lens hood on the Canon SX1 is small, and remarkably does reverse, but it's so hard to find the lock spot that I just left it on pointing forward. Modes. Options on the Canon SX1's Mode dial include Programmed Auto, Shutter Priority, Aperture Priority, Manual, and Custom modes. You use the wheel around the Control dial to change the shutter speed in Shutter Priority and the aperture in Aperture Priority. In Manual mode, a press of the EV button switches between the shutter speed and aperture. The Canon SX1 also includes a green Auto mode. The Shooting menu is restricted to movie size, quality, and image size settings. ISO is restricted to Auto or Hi. Macro is either Macro or Normal (no Super Macro). Manual Focus is not available. All that makes it safe to hand off the camera to that relative who can never put anything back where they found it. Image Zone modes include Portrait, Landscape, Night Landscape, Sports, Special Scene modes, Stitch Assist and Movie modes. Special Scene modes are (Foliage, Snow, Beach, Sunset, Fireworks, Aquarium, Night Scene, Indoor, ISO 3200 at a small image size which varies by aspect ratio, Color Accent, Color Swap, and Long Shutter. You use the Control dial's wheel to change from one to another, but like any control wheel I've used, it's awkward. Sometimes it does what you want, most often not. Stitch Assist guides you through a series of overlapping shots to create the images you can later assemble on the computer into a panorama. Movie Mode provides options for the H.264 format MOV video with linear PCM stereo audio the Canon SX1 can caption. Options include High Definition at 1920 x 1080 (30 fps); Standard Definition at 640 x 480 (30 fps), and 320 x 240 (30 fps). You can record up to 4GB or 29:59 minutes/seconds in HD or 60 minutes in SD per clip. You don't have to actually select Movie mode on the Mode dial to use it, however. You can just press the Movie button whenever you see some action you want to capture. Menu System. The Canon controls and menu system are comfortable to use once you learn how to play the game (which seems to change a little on each model). After you pick a Record mode, just hit the Function button to see your shooting options. Hit the Menu button for general camera setup options any time. Battery & Storage. The Canon SX1 uses four AA batteries. 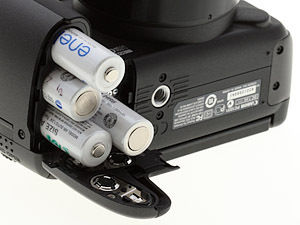 With rechargeable Ni-MH batteries, Canon estimates about 420 shots with the LCD on using CIPA testing standards. You'll get about 840 minutes of playback time with a full charge on the same Ni-MH batteries. 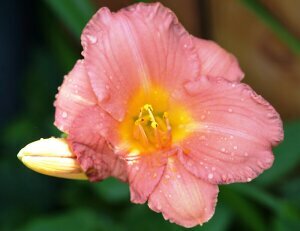 I used the four Panasonic alkalines included with the Canon SX1. They're rated for just 160 shots or 720 minutes of playback. That's not bad, but we recommend purchasing some Eneloop-style NiMH rechargeable batteries, often called Pre-charged batteries, for longer life. The Canon SX1 uses an SD card to store images, supporting SD/SDHC Memory Cards, MultiMediaCards, MMC Plus Cards, and HC MMC Plus Cards. A 2GB card will hold 448 SuperFine 4:3 JPEGs or 538 16:9 JPEGs. The same card will hold 22:45 640 x 480 movies at 30 frames per second or 1:04:01 320 x 240 movies at 30 fps. And a 16:9 HD movie at 1,920 x 1,080 and 30 fps can go 6:07. An 8GB card will hold 24:30. A $65 CA-PS700 Compact Power Adapter is available, but was on backorder when we checked the Canon site. Shooting. If my first impression of the Canon SX1 was of an ugly duckling, I gradually came to see that awkwardness as a result of the capabilities Canon has packed into this little package. The Canon SX1 packs a lot of photo power behind its 20x zoom. It may be a little hard to harness it at first, but once you do, you'll be doing some amazing things with this camera. I certainly didn't appreciate the images I was capturing on my first outing, a hike along Crystal Springs reservoir. The views were great and the 16:9 high resolution image size let me capture them with the drama I felt on the scene. But the LCD only showed blown-out highlights with very contrasty images. And the EVF, which I used most of the time in conditions too sunny for the LCD, was even worse with much lower resolution. Some images actually were blown out. The digitally zoomed image of the geese is one example. That's just not a good shot. And the close up of the flora in the first row of the gallery shots is very soft, despite a shutter speed of 1/318 second. It felt a little awkward trying to focus in the wind that afternoon. You'll see a good deal of chromatic aberration in those shots, too, particularly in the Madrone tree. But the bottle brush bush shot above right shows what the Canon SX1 can do. While these defects are real, the problem is actually viewing high resolution images on a small screen more than with the Canon SX1. Examining 10-megapixel images and larger on your screen, as we noted in our Dogpatch story, "you have your nose to the glass at the candy store and are fogging the window. To properly evaluate 10-megapixel images and larger on your screen, they suggested, you should view them at 50 percent rather than 100 percent." My next outing was another long walk, this time covering my tracks with a few Raw images. You can shoot Raw with the Canon SX1, which puts it in small company among its competitors (the Panasonic FZ35 and Kodak Z980 also shoot Raw). There are a handful in the gallery to play with. What struck me about the SX1's Raw shooting was that I hardly knew it was enabled. There was no noticeable delay as the data was written to the card, unlike other Raw captures I've made with digicams. Raw captures were about 13MB files compared to their 3.3MB JPEG equivalents. Shooting Raw also captures a large JPEG. Raw shooting does slow down continuous mode, of course, capturing only five frames in RAW mode, and four in RAW+JPEG. You have to enable Raw capture in the Shooting menu (use the Main button) and select 4:3 aspect ratio. It isn't available in 16:9 mode. Another thing that struck me about these shots was how the ISO fluctuated. That's a good thing. Some cameras stick to the lowest ISO more in an attempt to avoid image flaws (like noise) than to achieve quality. That Canon is confident in the quality of its higher ISO settings is refreshing. In bright sunlight the Canon SX1 chose ISO 259, for example. Canon uses that leeway to get a faster shutter speed, it seems, rather than greater depth of field. ISO 1,600 wasn't quite as convincing as I expected from looking at the capture on the LCD. The color was washed out, although detail was strong. Note particularly the doll shot where the yellow hair and red lips are muted but the eyebrows and eyelashes are sharp at full resolution. In general, while the poor display quality of the LCD and EVF in the field didn't get me very excited about the shots I was capturing, I liked the color and detail I saw on my monitor. I did see quite a few image defects from chromatic aberration to noise in the shadows of even sunlit shots, but if your preferred output is prints, that may not matter to you. Despite the claims made for this CMOS sensor, we don't see it performing better than the CCD-based SX10 IS at all; indeed, it seems to have a little more luminance noise across the board than the SX10. Still, the Canon SX10 works well enough for a very long zoom digital camera. Large capacity SD/SDHC memory card. These days, 2-4GB is a good trade-off between cost and capacity. The articulated screen, while a wonderful idea, is a 16:9 LCD that is, well, awkward to articulate (especially with the shoulder strap in play). With the lens shade on, you can easily pinch your fingers when you turn the camera off if you're holding the camera by the large lens housing. Ouch! Among long zooms the Canon PowerShot SX1 IS distinguishes itself for its solid build and full features, including a DIGIC IV image processor, 10-megapixel CMOS sensor, 20x zoom lens with 4x digital zoom, articulated LCD, Raw captures, 1080 HD movie captures, and a remote control. The question really comes down to image quality. I find that to be on a par with the SD990 IS and SX10 IS, exhibiting the same minor problems with chromatic aberration and noise in the shadows of sunlit shots that are not evident on printing standard size enlargements. Where you will have a problem is when you raise the ISO, or when you point the Canon SX1 IS at a red object. The camera has a problem with subtle contrast in some red subjects, blurring detail even at ISO 80. It's something we've seen in many cameras, including Canon SLRs, but not at ISO 80. For the most part, though, you can print a 13x19-inch print with reasonable detail up to ISO 200. ISO 800 files are really better kept at 5x7, and ISO 1600 files are only useful for 4x6-inch prints. That's not on par with other recent cameras, whose higher ISO images don't decay in quality quite as quickly. Still, the Canon SX1 performs well enough to produce a 13x19-inch print at its lower ISO settings, and though it doesn't quite rise to all we expected from this special CMOS sensor, it does capture images well enough that those not printing larger than 11x14 or 8x10 should be very happy with it. If you need a stereo long-zoom HD camcorder, of course, the Canon SX1 is easier to recommend.